Salsola tragus (Russian-thistle) is a large, bushy summer annual (family Chenopodiaceae). It can be found throughout California, including in agricultural areas, desert, roadsides and other disturbed areas. 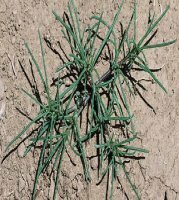 Russian-thistle can impede traffic, create fire hazards, and is a host of the beet leaf-hopper, an agricultural insect pest.